Aelia Eudoxia was the daughter of Bauto the Frank. She was married to Arcadius in 395 AD. 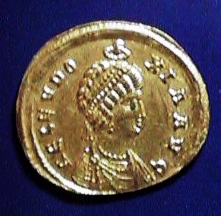 She was the mother of Theodosius II. Eudoxia was perhaps the first dominant woman to rule the Roman Empire. Her husband was rather meek and as a result her influence over her husband was unquestionable. Between 400 and 404 AD, when she died, Eudoxia was the virtual ruler of the Eastern division of the Roman Empire.